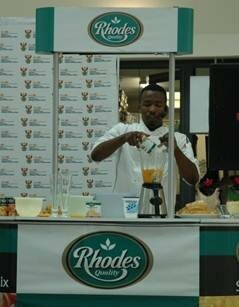 Rhodes Foods joined the Department of Trade and Industry and other members of SAFVCA at the Eat well, Eat safe, Eat local and Nutritious Expo at Vangate Mall in Athlone on Monday. Minister of Trade and Industry, Rob Davies, delivered the keynote address while Chef Lentswe Bhengu demonstrated how to prepare delicious and healthy meals using Rhodes Foods canned products. Minister of Trade and Industry, Rob Davies, (centre) delivered the keynote address which was aimed at educating Athlone residents about nutrition and food safety as well as promote the consumption of local produce. 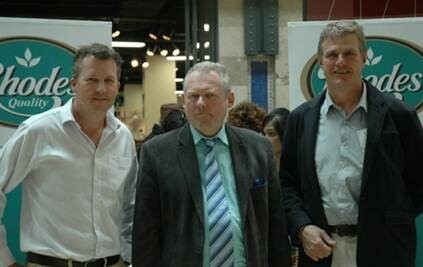 Commercial Director at Rhodes Food Group, Richard Phillips (left) and the MD of Rhodes Foods Division, Gerhard Kotze (right) joined minister Davies at the expo. 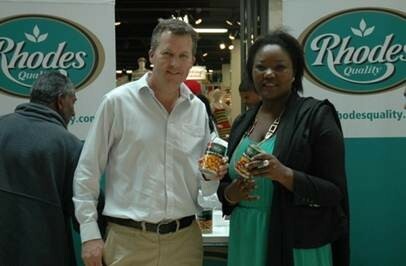 Commercial Director at Rhodes Food Group, Richard Phillips and the National Director, Agro Processing Unit, Department of Trade and Industry, Unati Speirs at the Rhodes Foods stand. Chef Lentswe Bhengu demonstrated to Athlone residents how to prepare easy and delicious meals using Rhodes Foods canned products.